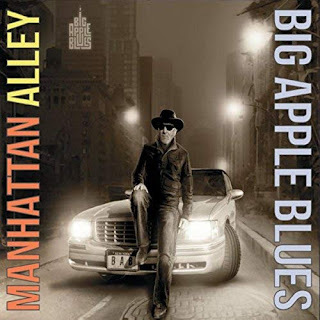 I just had the opportunity to review the most recent release, Manhattan Alley, from Big Apple Blues and it's quite good. Opening with the funky driving ball runs of Admir "Dr. Blues" Hadzic, on You Gotta Start Somewhere, this track is rolling. With Barry "The Baron of the Blues" Harrison on drums, Zach Zunis rips a great solo on guitarand Chris Eminizer really pours on the heat on sax, backed by Jim Alfredson on B3 and keys and Anthony Kane on harp. Take Two is another great track with a great funky bottom. Zunis is back again with a really nice solo and Alfredson really gives that keyboard a workout with just the right amount of horn to give it the kiss. Excellent! With an easy sway, Deep Talkin' features Alfredson and some deep, deep horn work. Putting me in mind of Passport or Oblivion Express, this is solid ground. Very nice. Steamroller is a prime fusion groove with a great bottom compliments of Harrison and Hadzic, and lead work by Zunis, Alfredson and Eminizer. Very nice. Subway Rumble has a cool groove with strong guitar lead by Zunis and adventurous B3 work by Alfredson. Love As I Know It is a strong soulful instrumental ballad with guitar and keys melodic lead. There is strong support of course from bass and drums but the fire is upfront. Very nice. Wrapping the release is Rock On, an easy driving blues rocker with guitar and B3 soloing throughout. This is a a really nice closer for a strong release.